Have you ever had a stray photograph that keeps showing up time after time in a drawer or box of keepsakes? It evokes such memories that you stand suspended in time for several minutes every instance that it resurfaces. You know you should put it in an album with all the others, but somehow you don’t. You lovingly replace it where it may seem out of place knowing that you will return to uncover long lost memories on some other such day. We also have mental snapshots which keep popping into our minds unbidden just as fresh as the day that they were recorded and stored in our hearts. God brings these precious memories and cherished object lessons back just when we need them. One such mental snapshot which keeps returning to me is of a large turtle in the middle of the road. I have named him Turtle, as if he were the one and only turtle in the world. The Holy Spirit uses him as an object lesson for me much as Jesus used parables when teaching His disciples. It had been one of THOSE days when nothing went right. Everything went from bad to worse to inconceivable. Things were coming at me from all directions, fast and furiously. I was completely out of control of the circumstances in which I suddenly found myself. 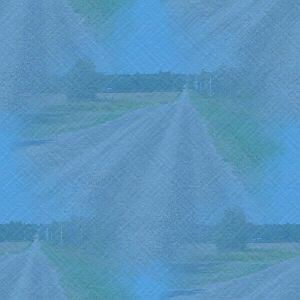 As I drove down the road on the verge of tears, I had to make myself concentrate on my driving. Something caught my attention, moving into my lane from the side of the road. Focusing my eyes, I realized that it was a huge box turtle slowly trying to cross the road. I wanted to make sure of his location before I reached him. I was far enough away that I had time to observe his lack of progress. Time seemed suspended as a silent movie unfolding frame by frame before me. 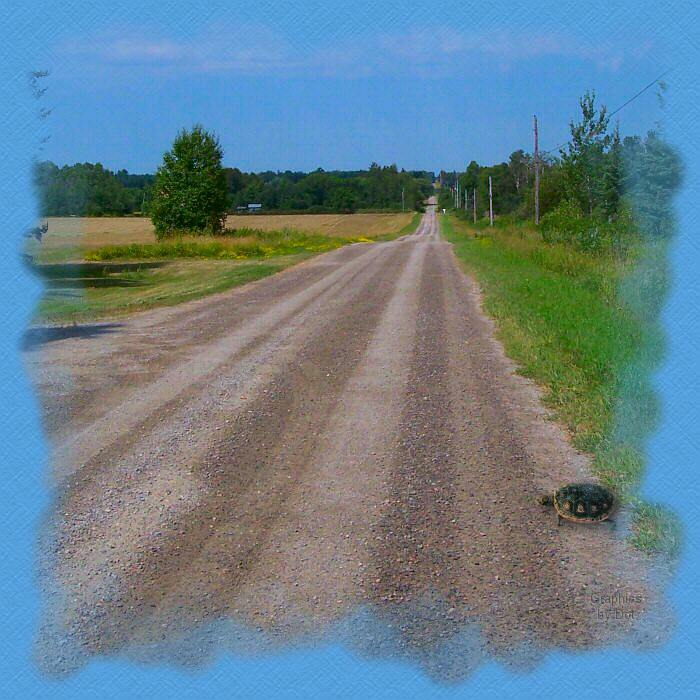 Turtle had not a worry in this world until he looked up and saw my large blue Chrysler New Yorker rapidly approaching. I had slowed down considerably, but to a turtle, I was definitely flying. If turtles show emotion, he must have had sheer panic on his face. After a stunned moment Turtle shifted into high gear, which still had me concerned for his safety. He reached out his long neck as far as he could. Turtle grabbed the asphalt with his claws and pulled with all his might. He clawed his way across the pavement as fast as terrepinely possible. Watching and urging him on, I noticed just how strong and muscular Turtle actually was. He was giving it his all. (For a turtle he was moving on!) This could not have taken more than a minute or two at the most; but to me and especially to Turtle, it seemed like forever for him to get to that double yellow line. Only then did he turn to look in my direction again. Are turtles capable of sighing in relief? Well I believe this one did. As I came closer he surely seemed relieved. UNTIL he looked in the other direction. You’re right. There was another car coming around the corner. He had even less time to make it across to the other side from the center of the road than he had to escape me. Again, Turtle shifted into high gear. His strong legs clawing and pulling as his neck strained farther than before. As I passed by where Turtle’s life and death struggle was continuing, God lovingly placed this mental snapshot into my heart for future reference in my times of need. Unlike me, Turtle was not focused upon his problems. When imminent danger approached, Turtle identified the enemy, but kept his focus on the way out. With all his might, he did all he could to escape. He did not freeze with fear. He moved forward steadfastly. Turtle was not overcome by multiple troubles. He persevered against all odds. As I passed by, Turtle was almost across the road. There was another car behind me and nowhere to pull over on the side of the road. Thoughts nagged at me as I passed by him. Did Turtle make it? Was he okay? I turned around as soon as I could and headed back. What would I find? I was reluctant to look as I passed the spot. Turtle was nowhere to be found. There was no sign that he had been hit or killed. What a relief! I believe since God used Turtle as an object lesson for me that he kept him safe. Now when the onslaught of the devil becomes overwhelming, that mental snapshot of Turtle comes to mind, assuring me that God does care enough about me to send me assurance of His love and protection. God is there, but He expects me to my best to persevere just like Turtle. Turtle was the first but not the last that I remember seeing in the road. Each time I see a turtle, I pray for all those having a Turtle-in-the-middle-of-the-road day. If you see a turtle in the middle of the road, pray for me.